Judith Lowry's voice and experiences make a rich matrix for essays that include discussions of wildflower gardening, the ecology of native grasses, wildland seed-collecting, principles of natural design, and plant/animal interactions. 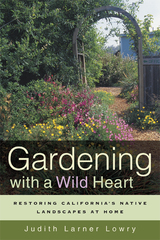 This lyrical and articulate mix of the practical and the poetic combines personal story, wildland ecology, restoration gardening practices, and native plant horticulture. For the past twenty-eight years Judith Larner Lowry has been the proprietor of Larner Seeds in Marin County, California. Her essays on native plant gardening have appeared in numerous magazines and anthologies.